There are a myriad of interesting watches out there. Some come in the form of a pocket watch (my personal favorite), wrist watch, necklace, and much more. There are plain ones, those that are hard to read, and just when you think you’ve seen them all, a new idea blows you away. In this case, time is being told through the form of a ring. 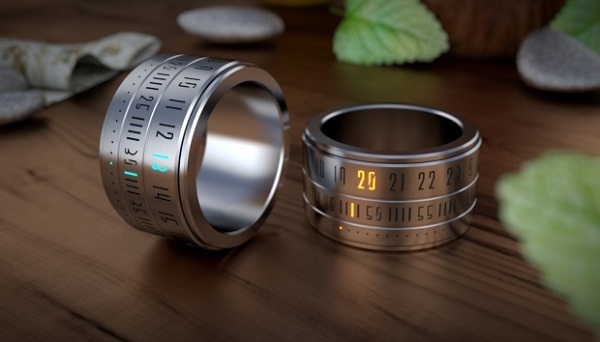 The Ring Watch is not big or flashy, but it is an ingenious idea. Many people don’t wear a watch, usually because they are too bulky (also because everyone just uses their phones to see the time of day anymore). This is currently a crowdfunding project, but it’s looking rather promising. The ring will be made of a surgical steel which will be nice for people who have metal allergies. It utilizes an ultra-thin rechargeable lithium polymer battery which should last about 3 years with 15 times of 1-minute activation per day. The maximum amount of charging time needed on the wireless Qi charger pad is 2 hours, and this is also where you set the time. You can choose either blue or orange LEDs for your ring, and it is said to be water-resistant. Sadly, the battery in this ring is non-replaceable, which means it won’t be functional past being a fancy-looking ring after that time. That being said, dropping anywhere from $195-250 on this seems a bit much. However, if this is something you’re really pining over, contributing to this first round may mean a discount for whenever they start refining it in the coming years. There always seems to be a bit of a risk with these projects, and you never know when it’s going to be worth it or not. Really? I wouldn’t pay $2.00 for this watch that will die on me in few years and needs to be recharged daily, so if you forget to charge it one day, your late- no thank you, I care about my job too much to leave it to this ring ding.